This Ulvang merino training top is one of those test buys I got from SportPursuit, though curiously, because of their very weird delivery system, it’s been one of the first to arrive. A Norwegian brand, it is produced in collaboration with champion skier Vegard Ulvang. The training top is 300gsm, which was the main reason I decided on it. I own a lot of 140g merino and some 240g pieces from Finisterre, but I wanted something really warm and snug for the bike. This is now the warmest merino base layer I own. 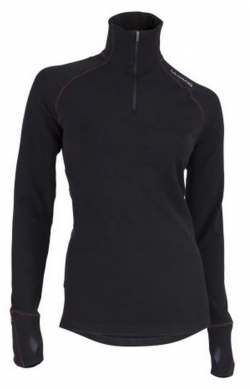 I also liked the design of the high zip neck and long cuffs with thumbholes. There are two weights of fibre in this garment – 98 per cent merino with 2 per cent lycra for the main panels and a lighter weight mesh wool-poly mix with stretch for the sweat panels, which are under the arms, at mid-back, at the neck, and on the lining of sections of the palms. The addition of lycra throughout makes the garment amazingly stretchy and technical, and I could easily have gone down a size. The fabric is smooth and soft and a little bit brushed in feel. The neck is more of a funnel than a turtle and is lined with an interior pleat, so when you undo the zip, you’re still covered – there is no gap. There is no zip garage, however, so if you don’t want to get biffed in the chin every time you look down, you need to fold the neck down like a polo. It’s also very long – almost as long, on me, as a short dress, and the hand sections come up as high as the base of the fingers. Ulvang claims that there are no interior scratchy labels, but that isn’t true – the one at the neckline on this garment drove me nuts and I had to flip it up to stop it scratching my skin. But it’s extremely snug. I wore it (all day) on the day I got my flat tyre and in our cool house, it was more than enough with a lambswool gilet, which I removed from time to time. I folded back the cuff sections when indoors, and the stretch made them very close. Out on the road, I wore it alone under a windshell and it was very snug and warm – I never thought about my temperature once, even when standing at the side of the road waiting for my pickup, following my flat tyre. The garment is also attractive – every seam is double channel stitched (flat fell seams?) in pink and the mesh sections are pink and black fleck. Ulvang logos decorate it here and there, which appear to be in retroreflective paint. Overall, there is much more pink on the garment than you could guess from the photograph. I couldn’t be more pleased with this garment, other than that a zip garage would make it a tad more comfortable. I paid 48.88 euros for it rather than the RRP of 160.65 euros.